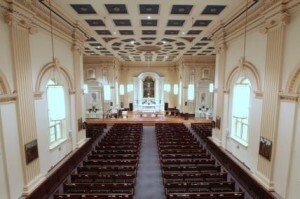 Completed in 1837, St. John the Evangelist is a historic Catholic Church in Frederick, Maryland with a Grecian ionic design and a cruciform floor plan. The church has carpeted floors but its spacious marble and plaster interior and hardwood pews create major challenges for voice intelligibility. St. John’s existing sound system had poor intelligibility and coverage and a recurring feedback issue. In 2011, Eric Johnson of Audio Video Group offered St. John’s a new system using Community’s ENTASYS column line source loudspeaker system. Johnson performed a live demonstration that showed his design could provide intelligible sound with even coverage while minimizing audio feedback. St. John’s new system has an ENTASYS ENT-FR full-range column and an ENT-LF low-frequency column on each side of the chancel tilted slightly downwards to avoid rear-wall echoes. The left and right transepts and the rear of the church are covered by ENT206s. A pair of ENT203s provides coverage for the balcony and choir loft. Johnson used an Earthworks gooseneck mic on the ambo and lectern and provided Shure wireless mics for the priests. St. John’s system uses a Biamp AUDIA FLEX for automatic mixing, loudspeaker delay and system equalization and Lab Gruppen power amplifiers. A small mixer in the balcony blends choir soloists and guitars into the service. St. John’s is very pleased with their new system’s intelligibility and coverage and its lack of feedback. Soon after the system was installed, a senior gentleman attending Mass asked the priest to please not change anything because this was the first time in a long time that he could clearly hear what was being said!